No matter the field, taking a scientific approach can pay dividends -- da Vinci's paintings used as much science as art, and Brian Cashman's won several World Series with his version of "moneyball", i.e., throwing actual balls of money at players. Now dropping meat science at your doorstep, 35 Degrees Steaks. From a father/ son duo who mastered the protein game running a company that supplied restos from Wolfgang Puck to Pebble Beach's clubhouse, this newly founded, direct-to-consumer enterprise specializes in "the science behind the sizzle", which apparently yields far tastier results than "the science behind the Sizzler". Their process includes selecting only Midwest family farm, genetically-verified Angus cows that're fed a combo of corn, barley, wheat & soy; cuts are made according to whatever weight produces the thickness that looks most impressive on a plate, then wet-aged in vacuum-sealed packages for 21-35 days at an optimal 33-35 degrees (and here you thought they were named for a cooler version of 98 Degrees). The finished product's packed in foam cushioning, then thrown in a box that itself is wrapped in a Macbook-esque Ziploc and tossed in a custom cooler with 35D's own gel refrigerant packs -- as opposed to other companies who "freeze the hell out of their steaks", though at least that gives Arnold something to do after his political career winds down ("Everyone chill!"). 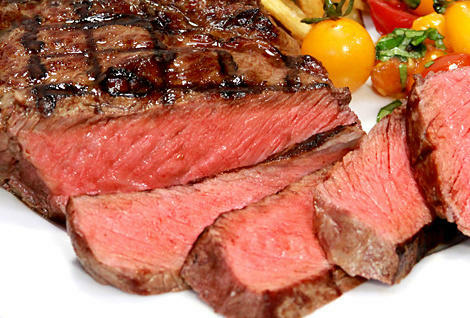 As for orders, you (yes you) can grab specific cuts, or assortments like the freakish "The Grill is Gone" (124oz NY sirloin roast + 56oz filet mignon tenderloin roast), or, with eight NY strips and four filets, "The King and Queen", after which you'll have to perform the simple science of ramming those two bed sizes together to fit a man who's no longer in motion, because he's become Kevin James.